(FinalCall.com) - A new report from the National Association for the Advancement of Colored People is critical of America's “misplaced priorities” in overemphasizing and overfunding the prison industrial complex while underfunding education. According to NAACP President and CEO Benjamin T. Jealous, excessive spending on incarceration undermines educational opportunities and destabilizes Black communities nationwide. “Today, there is no greater threat to civil rights accomplishments than the state of our country's education system and its impact on young African American youth. Failing schools, college tuition hikes, and shrinking state education budgets are narrowing the promise of education for young people all across the country. Meanwhile, we continue to invest billions of dollars into our corrections system, sending our youth a clear message that we value incarceration over education,” said Mr. Jealous introducing the report. According to the NAACP, state spending on prisons grew at six times the rate of state spending on higher education over the last two decades. Many of those incarcerated have low levels of educational attainment, high levels of unemployment and quite often are victims of substance abuse. Currently, there are over 2.3 million people in prison in America. Many cities across the U.S. are facing budgetary shortfalls, and as a result teachers are being laid off, schools closed, extra-curricular programming cut, and class size grows. An additionally troubling statistic is that in many major metropolitan areas with large Black populations such as Chicago, Detroit, Cleveland and Atlanta, high school dropout rates hover close to and surpass 50 percent in some cases. 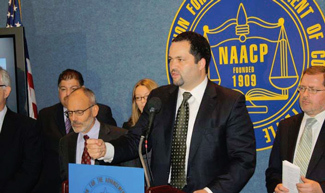 Interestingly, the NAACP received support from many conservatives, including possible Republican presidential candidate Newt Gingrich, Rod Paige, former Secretary of Education under President George W. Bush and Grover Norquist, president of Americans for Tax Reform. In a letter to Mr. Jealous, Mr. Gingrich emphasized the prison reform aspects of the NAACP's report, as well as a critique about the levels of recidivism seen in the U.S.
“We have a wonderful window of opportunity right now to achieve lasting change in the way in which we rehabilitate our offenders and break the devastating cycle of crime and incarceration in many of our neighborhoods,” Mr. Gingrich wrote. “The report released today highlights many innovative solutions that rightly emphasize rehabilitation, aim to reduce recidivism rates, and fortify communities across the country that have been ravaged by mass incarceration. The effects of rampant incarceration in recent years have been devastating for families, neighborhoods and civil society,” he added. Pat Hill, president of the African-American Police League in Chicago and a human rights activist, agreed with the findings of the report. While it may be a revelation for many conservatives and others unfamiliar with urban realities, within the Black community, this is not new information, said Ms. Hill. She also views with caution conservative backing of the report when their policies led to funding disparities in the first place. “The Republican, or conservative right wing agenda, historically and currently is still not in the interests of Black people,” she added. • In Los Angeles, more than a billion taxpayer dollars are spent every year to incarcerate people from Los Angeles neighborhoods where less than 20 percent of residents live. The Los Angeles Unified School District expects to lay off 7,000 teachers this year. • In Jackson, Mississippi, Gov. Haley Barbour has proposed slashing $65 million from Mississippi's Adequate Education program. • New York city schools lost between $400 and $500 million in funding in the 2009-2010 fiscal year. Taxpayers spent over $539 million to imprison residents sentenced the year before. • In Philadelphia, taxpayers spent nearly $290 million to imprison residents sentenced from neighborhoods representing just over one-quarter of the city's population, accounting for more than half of the over $500 million of the city's prison budget. The school district in 2009 faced a budgetary shortfall of $197 million. The NAACP's website provided one case study highlighting these misplaced financial priorities and stringent sentencing guidelines in the plight of Hamedah Hasan, a grandmother and mother of 3. After leaving a physically abusive relationship and going to live with a cousin, Ms. Hasan found herself involved in running minor errands for her cousin's drug operation. In 1993, she was charged with conspiracy to deliver crack cocaine, which made her liable for all drugs ever associated with her cousin's drug operation, regardless of the small role she played and she was sentenced to 27 years in prison. Having already served over 16 years behind bars, it is estimated that the federal prison system has paid approximately $410,000 to keep her locked away. In an April 7 NPR interview, Mr. Jealous cited instances such as the state of Pennsylvania pulling $300 million out of its education budget and placing it in the prison budget, or Connecticut, spending $400,000 to incarcerate a person, yet less $10,000 to send a child to school, as reasons to reexamine funding priorities. A nationwide billboard campaign was also launched to coincide with the release of the report.